George Washington Carver, best known as the inventor of peanut butter, was a botanist, chemist, and inventor whose work revived the late 19th and early 20th century agricultural economy of the American South. Born the son of slaves, he never knew his parents. His father, who worked on a neighboring plantation, died before Carver was born, and his mother, two of his siblings, and the infant Carver were kidnapped during the Civil War by bushwhackers (Confederate guerrilla warriors). The plantation owner sent two horses as a ransom, but only the relatively worthless infant was sent back to his owner's plantation -- the kidnappers kept Carver's mother, brother, and sister, and he never saw them again. As the war raged, Missouri was a border state between North and South where slaves were likely to escape North or be liberated by Union troops, so after the kidnapping Carver's owners sent their remaining slaves, including young George, to be held further South in Alabama. When the North won the war the other slaves scattered, but his former owners, Moses and Susan Carver, sent for George's return and raised him. He thought of them as Uncle Mose and Aunt Sue; they taught him to read, told him he was "as free as a bird", and their last name became his own. A somewhat sickly boy, Carver's childhood chores were mostly cleaning, cooking, assisting "Aunt Sue" in her garden, and gathering plants from the nearby woods. There his interest in plants was first sparked, and his talent with growing things soon became apparent. He was unable to attend a local school because of his color, but at about the age of 11 Carver was sent to a nearby town, where he attended a school for colored children run by the Freedmen's Bureau. A year later, bored with the school's lessons of reading, writing, and arithmetic he already knew, young George set out alone for Kansas, where he spent his adolescence working and attending schools in four different towns. In his late teens his mailed application was accepted to attend what is now Highland Community College in Highland, Kansas, but after making the long journey he was refused admission on account of his color. He then ran a laundry for several years, and briefly settled in Ness County, Kansas, where he was the first local black homesteader. In 1889 he was accepted at Simpson College in Indianola, Iowa, and after a year at Simpson he matriculated at Iowa Agricultural College (now Iowa State University), where he earned his Bachelors and Masters degrees and became the school's first black faculty member. By 1896, Booker T. Washington at Tuskegee Normal and Industrial Institute (now Tuskegee University) had decided that the all-black school should conduct agricultural research, and Carver (literally the only black person with a graduate degree in the subject) was hired, and began the research that made him famous. Southern agriculture was in serious decline at the time, the result of many decades of single-crop cotton cultivation that had left much of the soil depleted of nitrogen. Carver found that the soil could be revitalized by planting peanuts and soybeans, and advocated crop rotation -- growing peanuts one year, cotton the next, etc. This dramatically increased the cotton yield, but left farmers with a surplus of peanuts in alternate years, which sold at a poor price. To solve this new problem, Carver experimented with peanuts and developed more than 300 new uses for the little legume, from cooking oil to cosmetics, wood stain to printers' ink, peanut cheese, peanut coffee, and yes, peanut butter. Within a few years, the demand for peanuts had grown so much that crop rotation was no longer a financial sacrifice for farmers. Carver also developed a technique for fighting fungus disease in cherry trees, discovered dozens of new uses for pecans, invented methods to make paints and stains from soybeans, and to make sweet potatoes into flour, starch, synthetic rubber, and more than 100 other products. He made rope from cornstalk fibers, artificial marble from sawdust, carpets from weed fibers, and showed that numerous pigments and paints could be made from such materials as orange peels, coffee grounds, and Alabama's clay soil. Wanting these products to be affordable and accessible, he generally eschewed filing patents, and held only three. He published an extended series of pamphlets extolling new techniques and recipes, offered "short courses" in agriculture for farmers, and organized an educational wagon that traveled the South offering advice on practical, sustainable agriculture to farmers, black and white. Carver was also an accomplished painter, frequently using pigments and oils he had made himself. Before his death, he donated the bulk of his life's savings to continue his work at Tuskegee. 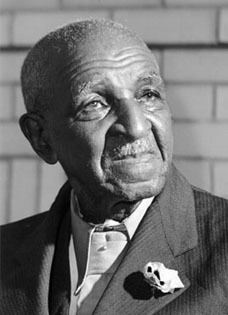 The Carver plantation where he was born has been preserved as the George Washington Carver National Monument. He was not related to US President George Washington, and his middle name, Washington, was apparently an affectation adopted in his late teens or early 20s. 1864 is frequently cited as his birth year, but in the 1870 census form filed by Moses and Susan Carver he is listed as being ten years old. Robert Staples, Exploring Black Sexuality (2006), page 66. Linda O. McMurry, George Washington Carver: Scientist & Symbol (1982), page 245, takes a more cautious stance, "Rumors of his homosexuality persist but are undocumented. The letters that most seem to confirm the rumors were written to white teenage boys, and Carver was smart enough not to risk a homosexual relationship with them in Black Belt Alabama."